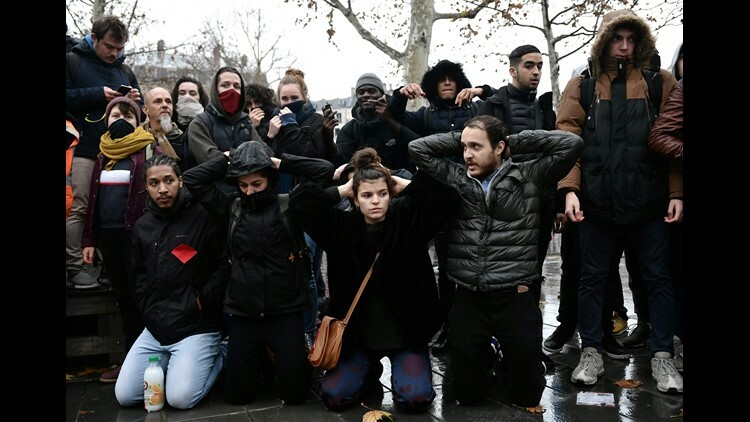 High school students re-enact Thursday's student arrest in Mantes-la-Jolie during a demonstration at the place de la Republique in Paris, on December 7, 2018. Video footage in France of police forcing protesting high school students to kneel in the mud with their heads bowed and hands behind their heads as they are watched over by armed, masked police officers has caused outrage in the nation as it prepares for a weekend of violent demonstrations that have already closed major tourist sites. Authorities across France are bracing for a third weekend in a row of clashes with anti-government "yellow jacket" protesters. They were initially angry over a planned increase to a fuel tax but their list of grievances has expanded to include President Emmanuel Macron's policies on welfare, education and other issues that disproportionately affect the working class. However, amid warnings from senior French officials that the protests could be infiltrated by more violent fringe groups, almost 90,000 police officers have been mobilized to protect shops, businesses and tourist attractions such as Paris' Eiffel Tower and the Louvre art museum, both of which have been closed for the weekend. "Some radicalized and rebellious people will try to get mobilized tomorrow," France's Interior Minister Christophe Castaner told reporters during a news conference on Friday. "Some ultra-violent people want to take part." Castaner added that the "yellow jacket" protesters – named for the demonstrators' brightly-colored vests that French drivers are required by law to keep in their cars – had "created a monster that has escaped from its creators." He said French authorities would respond "firmly" and with "no tolerance" to any "distress of our citizens." The video of the detained students, taken west of Paris in Mantes-la-Jolie on Thursday, shows police officers holding riot shields and batons as they watch over them. "Now this is a class that knows how to behave," a voice is heard on the video, according to French media and clips of the video that were posted on social media. The students had been protesting education changes to the way they are tested. In recent weeks police have clashed with high school students in cities across France over the issue. Castaner, the interior minister, said that none of the students were hurt during the incident but that 150 high school students, some of whom have weapons, were arrested in the small town. The youngest was 12. France's Le Parisien newspaper reported that these weapons included baseball bats, metal bars and pepper spray. Benoît Hamon, a former French presidential candidate, wrote on Twitter that the images of the kneeling students were "shocking" and "unacceptable." He said that the police had "humiliated" the students. "This is not the Republic," he said. Cécile Duflot, the head of humanitarian group Oxfam's France division, said the scenes shown in the video from the Mantes-la-Jolie school were "simply intolerable." The security measures put in place across France are expected to disrupt thousands of tourists and residents. High-risk areas such as the Champs-Elysees Avenue in central Paris have been cleared of any construction materials that could be used as weapons. The Nicolas wine chain, one of the biggest retailers in the country, canceled all wine tasting sessions scheduled for Saturday, the Associated Press reported. At least six French league soccer matches around the country have also been cancelled. "It’s with an immense sadness that we’ll see our city partially brought to a halt, but your safety is our priority," Paris mayor Anne Hidalgo wrote in a statement. "Take care of Paris on Saturday because Paris belongs to all the French people."